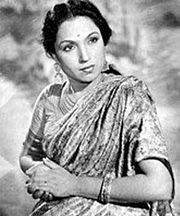 Lalita Pawar (18 April 1916 – 24 February 1998) was a prolific Indian actress, who later became famous as a character actress, appearing in over 700 films in Hindi, Marathi and Gujarati cinema, where she gave hits such as Netaji Palkar (1938), made by Bhalji Pendharkar, New Hana Pictures’ Sant Damaji, Navyug Chitrapat’s Amrit, written by VS Khandekar, and Chhaya Films’ Gora Kumbhar. Her other memorable roles were in the films Anari (1959), Shri 420 and Mr & Mrs 55, and the role of Manthara, in Ramanand Sagar's television epic serial Ramayan. Pawar was born as Amba Laxman Rao Sagun on 18 April 1916, into an orthodox family in Yeola in Nashik. Her father Laxman Rao Shagun was a rich silk and cotton piecegoods merchant. She started her acting career at age nine in the film Raja Harishchandra (1928), and later went on to play lead roles in the silent era and 1940's films, in a career that lasted until the end of her life, spanning seven decades. She co-produced and acted in a silent film Kailash (1932), and later produced another film Duniya Kya Hai in 1938, a talkie. Lalita Pawar, playing the lead in film, Himmat-e-Marda (1935). In 1942, as a part of a scene in the movie Jung-E-Azadi, actor Master Bhagwan was to slap her hard. Being a new actor, he accidentally slapped her very hard, which resulted in facial paralysis and a burst left eye vein. Three years of treatment later, she was left with a defective left eye; thus she had to abandon lead roles, and switch to character roles, which won her much of her fame later in life. She was known particularly for playing maternal figures, especially wicked matriarchs or mothers-in-law. She also notably played the role of the strict but kind Mrs. L. D'Sa in Anari (1959) with Raj Kapoor. Under Hrishikesh Mukherjee's direction, she gave the performance of a lifetime, for which she received the Filmfare Best Supporting Actress Award. And as the tough matriarch who falls in love in Professor (1962), and the devious hunchback Manthara in Ramanand Sagar's television series Ramayan. She was honored by the Government of India as the first lady of Indian cinema in 1961. Her first marriage was to Ganpatrao Pawar, which went sour after his affair with her younger sister. She later married film producer Rajprakash Gupta, of Ambika studios, Bombay. She died on 24 February 1998 in Aundh, Pune, where she had been staying for a while. ^ "Lalitha, an actress and a gentlewoman". Rediff.com. 26 February 1998. Retrieved 5 November 2018. ^ "Tribute to Laita Pawar". Screen. ^ "Lalita Pawar – Memories". cineplot.com. ^ Anari Archived 19 September 2008 at the Wayback Machine Indian Cinema, University of Iowa. ^ "Lalita Pawar." Indian Express. 26 February 1998. ^ Naseeb (1981 film) [Wikipedia.org]. ^ Sangeet Natak Akademi Award - Acting Official listing at Sangeet Natak Akademi Official website. Wikimedia Commons has media related to Lalita Pawar. Tribute to Laita Pawar at Screen. This page was last edited on 15 March 2019, at 06:09 (UTC).